Intimidation Clothing’s signature shirt for Jessamyn Duke has been named the fifth-best signature shirt in women’s MMA, according to Examiner.com. The shirt is listed with signature shirts from some of the top WMMA stars, including Carla Esparza, Michelle Ould, Bec Hyatt, Ronda Rousey, Miesha Tate, and Liz Carmouche. Duke is currently competing for Team Rousey on The Ultimate Fighter 18, where she made it to the quarterfinals of the first season to ever feature female fighters. The Jessamyn “The Gun” Duke men’s shirt features two guns on the front symbolizing her nickname with “DUKE” across the top of the back with her signature below. The Jessamyn Duke women’s shirt is a white shirt with purple printing featuring a gun with Jessamyn’s picture visible in the outline of the gun. Intimidation’s iconic shield logo appears on a sleeve on both the men’s and women’s styles. The release of the Jessamyn Duke signature shirts made Duke just the second female fighter to have her own signature tees from Intimidation Clothing joining UFC bantamweight Jessica “Evil” Eye. 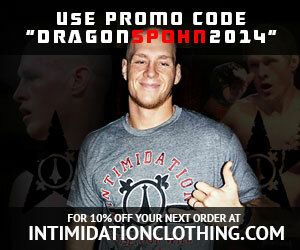 Intimidation reserves signature shirts exclusively for championship level professional fighters. Jessamyn “The Gun” Duke has a signature t-shirt available at IntimidationClothing.com. Fight fans should get them now while they are still available, before Duke becomes a household name. Intimidation Clothing is a fast-growing brand of lifestyle apparel & MMA training gear with a growing national presence and over 50 authorized dealers across the USA. The Intimidation brand is regularly featured on multiple sporting events on FOX, SpikeTV, AXS TV, SportsTime Ohio, MTV2, FUEL TV, The Comcast Network, Comcast SportsNet and EpixHD as well as MMA highlight shows on Spike TV, AXS TV and more. In addition to over 110 styles of high-quality, bold t-shirts and sweatshirts for men, women and children the brand is well known for their popular Vintage Series, Local MMA t-shirts, I Love #WMMA and Intimidate Cancer lines of merchandise. Anyone interested can become a dealer by applying to sell the Intimidation brand which is also available for sale online at IntimidationClothing.com. Fans can also follow the marketing wing of the Intimidation brand, Intimidation Interactive Media, @IntimidationIM, like Intimidation Clothing on Facebook or follow @IntimidationMMA on Twitter. Intimidation Clothing is pleased to announce a new promotion exclusive to purchases on IntimidationClothing.com. All purchases of a fighter signature shirt will receive a free gray Intimidation beanie for a limited time. Intimidation’s line of signature tees, which are limited to championship level professional fighters, feature 13 different MMA fighters and 17 unique designs. Included in that list are UFC Hall-of-Famer Ken Shamrock, TUF 18 star Jessamyn “The Gun” Duke, UFC vets Jason Dent, Forrest Petz, Wes Sims and Donny Walker, and the owner of Bellator MMA’s #1 knockout of all-time, Brian “The Predator” Rogers. In addition, current UFC fighters Jessica “Evil” Eye and “Relentless” Roger Bowling are also represented as 14 styles are men’s cut shirts with 3 being women’s styles. Intimidation Clothing’s most recent additions to the signature tee line include the Mark “The Pride of Bloomfield” Cherico signature tee (pictured, above, right), the Jessamyn “The Gun” Duke shirts in men’s and women’s styles, and the Brian “The Predator” Rogers 2013 tee (pictured, left) – Rogers’ second signature tee with his long-time sponsor. Team Intimidation sponsored fighter Jessamyn “The Gun” Duke (2-0) is becoming a standout star during her time on “The Ultimate Fighter 18,” which is currently airing Wednesdays on Fox Sports 1. After becoming the first-ever female to officially make her way onto a cast of TUF, Duke was picked to be on UFC women’s champion Ronda Rousey’s team of four female and four male bantamweight fighters. Duke is expected to compete in her quarterfinal match-up in the coming weeks, where she will look to earn a chance to move onto the semifinals and be one step closer to her chance at competing in the UFC. Intimidation also recently released a signature shirt for Duke, becoming just the second woman in company history to have her own signature shirt. The shirt is available in unique men’s and women’s styles. Duke earned her way into ‘the house’ with a first round submission via triangle choke over Laura Holdsworth on last week’s debut episode, and you can view the fight embedded below. Intimidation Clothing is pleased to announce the release of the official Jessamyn “The Gun” Duke signature shirts, which are now available for pre-order. Available in two different styles, one for men and another for the ladies, the signature shirts come on the heels of the announcement that Duke will compete on the upcoming season of The Ultimate Fighter 18. With the addition of the two signature shirt styles Jessamyn Duke joins an exclusive list of top-tier fighters with signature tees from Intimidation which includes UFC Hall-of-Famer Ken Shamrock, Bellator Middlweweight Brian Rogers, UFC vets Jason Dent, Forrest Petz and more. The Jessamyn “The Gun” Duke men’s shirt features two guns on the front symbolizing her nickname with “DUKE” across the top of the back with her signature below. The Jessamyn Duke women’s shirt will be a white shirt with purple printing featuring a gun with Jessamyn’s picture visible in the outline of the gun. Intimidation’s iconic shield logo will be on a sleeve on both the men’s and women’s styles. Last night on ProWMMA Now! Jessamyn Duke returned to the program ahead of next week’s The Ultimate Fighter Season 18 premiere to chat with Gina and Emily. Now that the season is over and it is time for the world to see what happened behind closed doors with camera’s rolling, “The Gun” will celebrating the premiere at Buffalo Wild Wings in Richmond. Jessamyn will be taking pictures with fans, signing autographs and giving away some items. There will be shirts from Intimidation Clothing, a sponsor of Duke. There will be tickets to Bluegrass Brawl 9 and Hardrock MMA up for grabs as well as shirts from our friends at Bangtown Fightwear. The show, which airs on FOX Sports 1, will start at 10. We will be there hanging out with all the folks and delivering interviews with Jessamyn and her teammates as the world gets introduced to Duke on national TV. Buffalo Wild Wings is located at 2139 Lantern Ridge Dr Ste 100 Richmond, KY so be sure to come out and support your local fighter! Duke (2-0), a Kentucky native, has the honor of being on the first season of the UFC’s prospect-driven series to include female fighters. Along with including female fighters, UFC women’s champion Ronda Rousey and No. 1 contender Miesha Tate will serve as coaches prior to squaring off for Rousey’s title at the conclusion of the season. The 27-year-old Duke has been heavily rumored to be part of the cast since the show was announced. She attended tryouts in Las Vegas in the Spring, following her first career loss (which was overturned to a no contest when it was deemed that an illegal knee was used) at Invicta FC 5 on April 5th. Her first two wins as a pro came via stoppage, and she posted a 5-2 amateur record from 2010-2012.